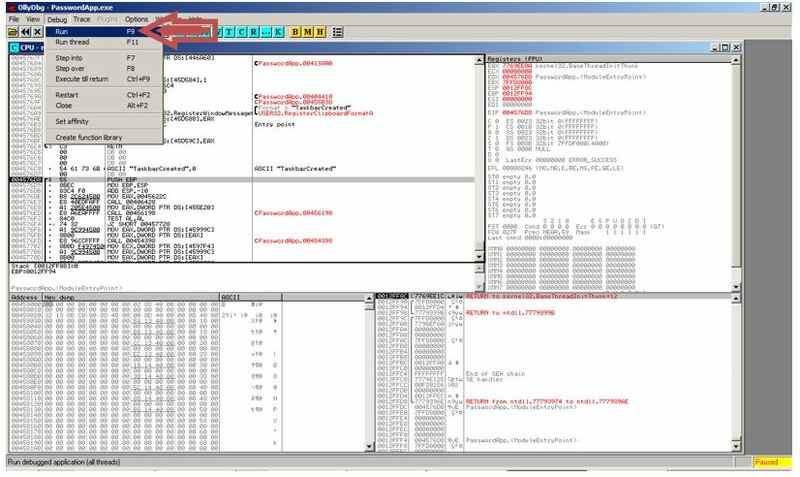 Reverse Engineering is an fascinating art of playing with low level code. 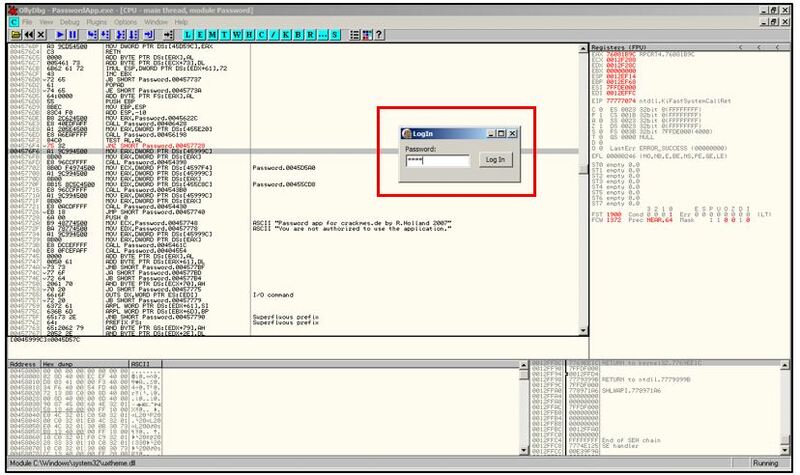 In this article, we will see a hands-on tutorial for patching an exe file to accept any serial key! 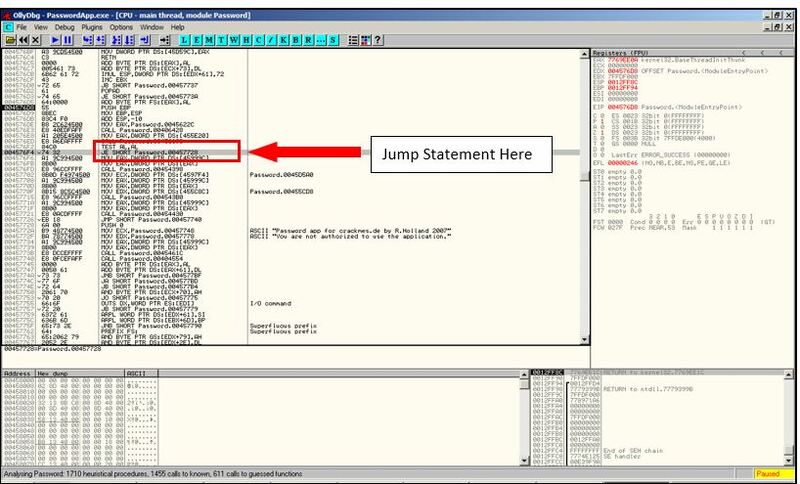 A crack-me is a small program designed to test a programmer’s reverse engineering skills. 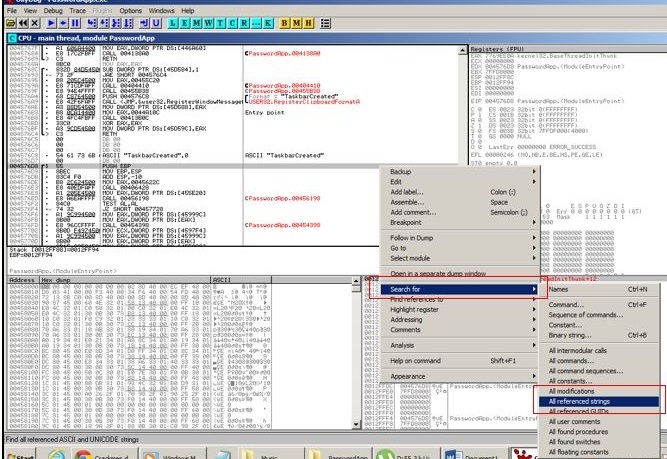 They are programmed by other reversers as a legal way to “crack” software. 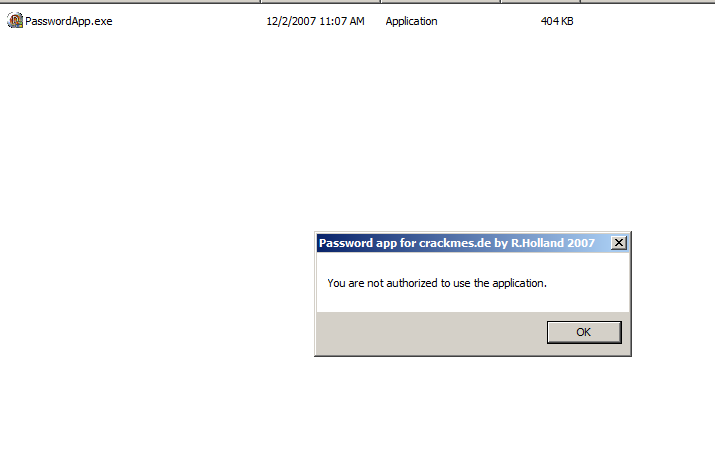 As you can see here is a sample crack-me, “passwordapp.exe”. Upon clicking the application, it shows us to enter a password for access. As normally expected, we will get a warning due to wrong password: Not authorized. 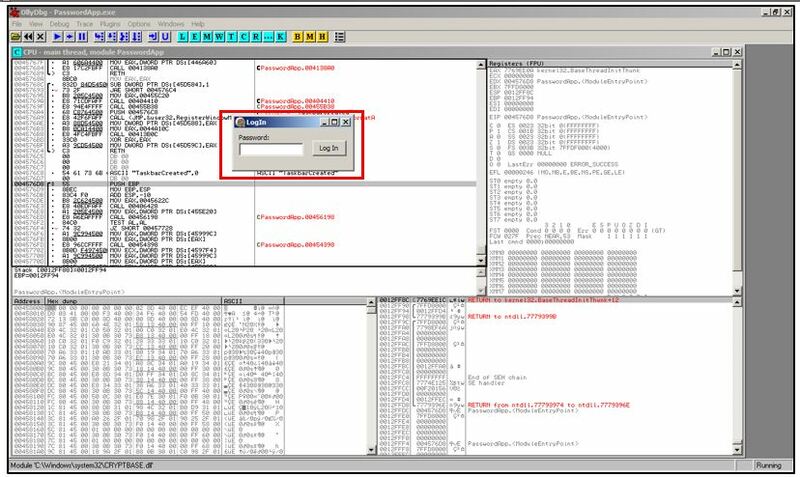 Now to patch this exe, we open “Ollydbg” to fire up the same app inside the debugger to analyze it. 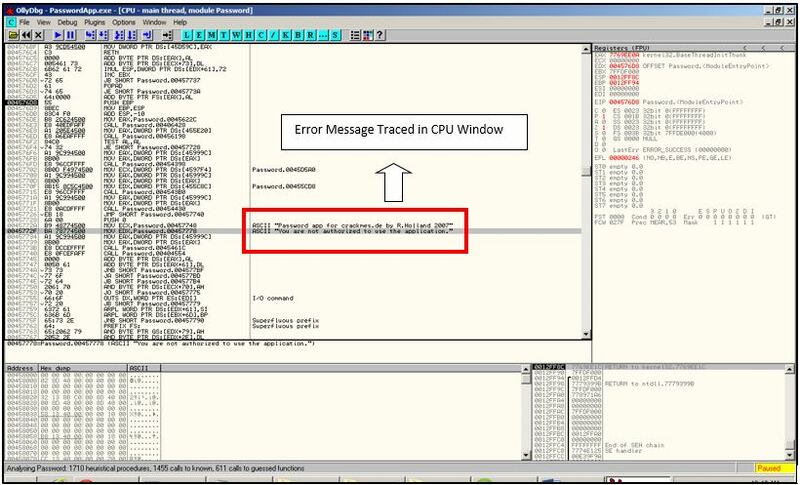 4) Memory Stack: The stack display pane showing comments, and the address of memory. 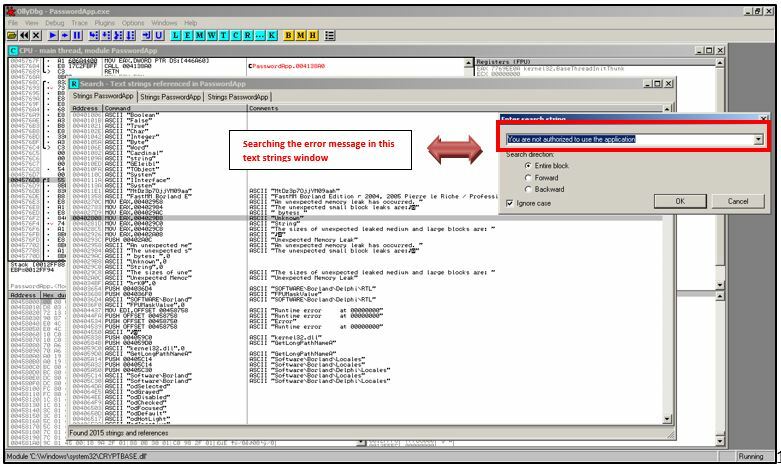 Click File /Open and the above box will pop up, select the appropriate directory and launch the app inside the debugger. 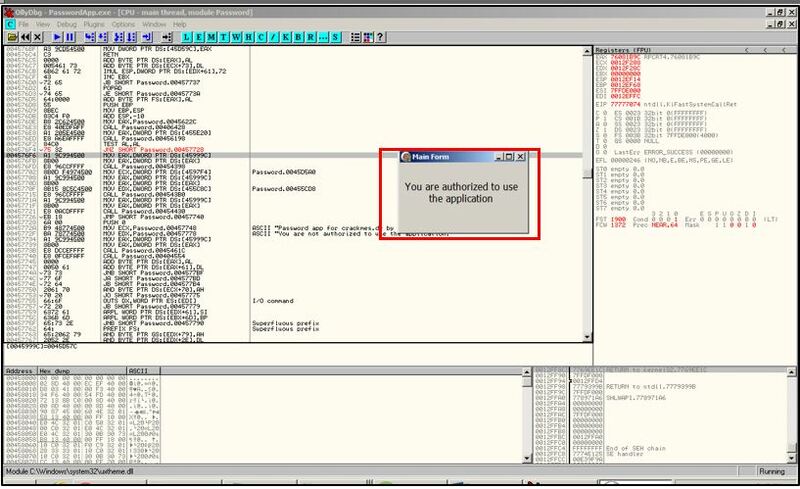 Once the application loads inside the debugger, we can the app inside the windows with all the assembly instructions visible. As a part of our inspection, we need to run the application again, but this time inside the debugger to inspect and analyze its responses. Go to debug menu -> and Click on Run. The application will again run inside Ollydbg. 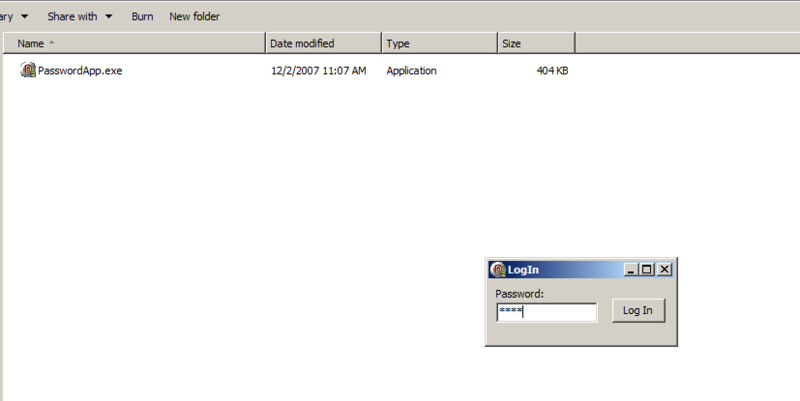 As usual the application is waiting for the user input for password. To test the application logic, we will again enter a random password as input. As soon as we again enter a random password, we are greeted with the same error as before. 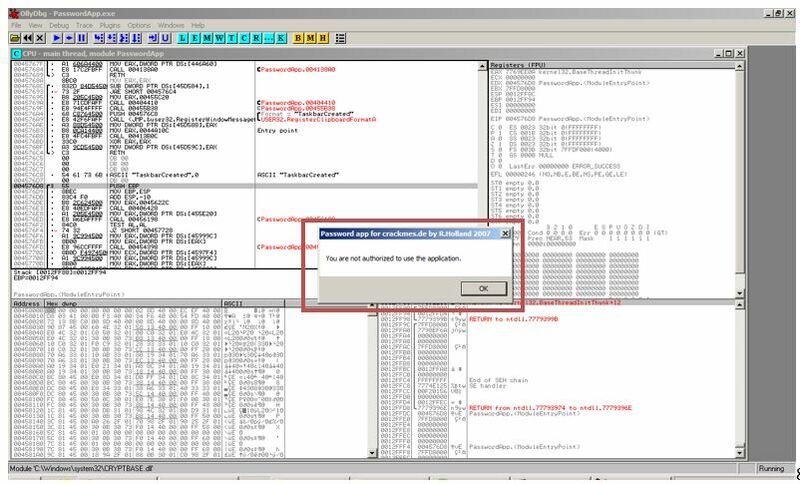 In simple applications such as these, often THE KEY TO REVERSING IS FINDING THE ERROR MESSAGE! Here just note the error message, which says we are unauthorized to use the application. Once we close the error message, just right click inside the console window and Right click -> Search for-> All referenced strings. Following this step is the reason, since now we will be hunting the error message, which we just encountered. On clicking all reference strings, we will get a text box, where we will type the error message. Once done, we get a window where all the ASCII strings of the application are present. Once we double click on message finding the window, we will be taken back to the main console. Observing closely, go a little above the line of the error message looking for a jump instruction. •Change JE SHORT Password.00457728 to JNE SHORT Password.00457728, JNE(Jump If Not Equal) means that if the password is correct it will give you the bad message and if the password is incorrect it will give you the correct message. 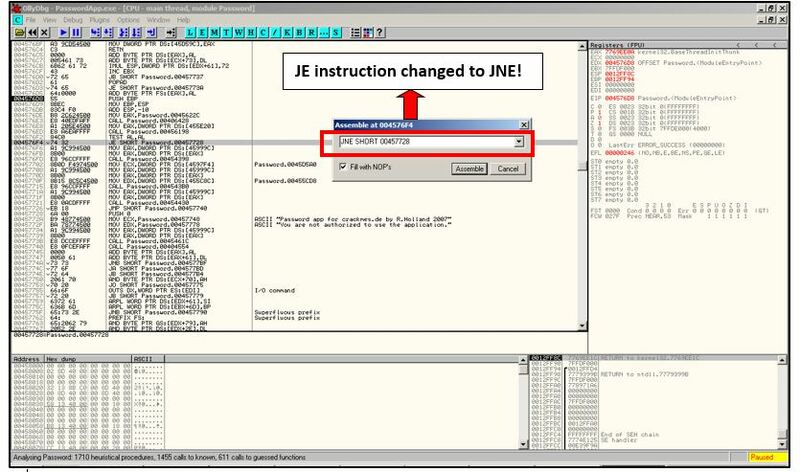 Here, I am changing the JE to JNE by double clicking on the instruction line. Again the application will ask us to enter the password, but this time the 1111 password which was wrong, will be ignored by the application about its authenticity thus it will directly jump to the “you are authorized” section demonstrating successful patching of the app. Hit assemble and re-run the app. Now to permanently modify the app to accept any password, simply save the modified exe. Right click on code window-> “copy to executable” -> “All modifications” -> Copy all-> “Save file”. So that’s it, we have patched a simple application.